Description: Sparta. 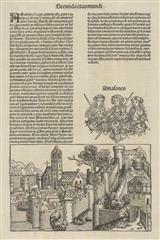 Uncoloured woodcut view from the Nuremberg Chronicle with an interesting depiction of the Amazons above. Description: Negroponte. Miniature map with text. Description: Beautiful example of the first atlas map of Greece, its islands and Macedonia based upon the survey of Giacomo Gastaldi. Original hand colour. Description: A hand coloured miniature map of Greece and the Aegean. Description: Greece, Macedonia, and Albania. Beautiful Dutch golden age map in original colour. Description: Greece, including Epirus, Macedonia, and Thessaly. Rare Michael Sparke edition with English descriptive text on verso. Coloured. Description: Greece. Rare Michael Sparke edition with English descriptive text on verso. Coloured. 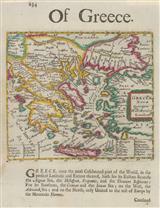 Description: Highly decorative map of Greece in sumptuous original colour, including the Aegean and islands. Description: Beautiful map of Thessaly, based on Laurenberg. Decorative cartouche and original colour. Description: Beautiful map of the Northern Aegean including Lemnos and Lesbos Decorative cartouche and rich original colour. Description: Beautiful map of Macedonia, embellished with ships and ornate cartouches. Rich original colour. Description: Northern Aegean. Includes Lemnos, Lesbos, Chios and Skyros. Embellished with ships. Original colour. Description: Archaea, with insets of Athens and Thebes. Coloured. Description: Greece and the Aegean Sea. Decorative cartouche. English descriptive text on verso. Coloured. 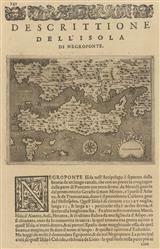 Description: A detailed miniature map with panel of text. Coloured. Description: Chart of the Eastern Ionian Sea orientated east to west showing Zante, Southern Cephalonia and the Western Peloponnese.